From Black to Red Plum Tones - What colour suit best? Answers and Comments for From Black to Red Plum Tones - What colour suit best? I think plum highlights will be good. You will need to go to a professional color salon, because your hair is colored black at the moment and this makes it more difficult to change the color to red plum. So go for a consultation and is usually free and let them suggest a good color for you. Your hair is really nice and you suite your hair. But i think you suite both. You will look really pretty. I think red will suite you alot! You might want it to be red. Just plain red!! I think it looks very good for girls with pale skin and blue eyes. My boyfriend has blue eyes and black hair with pale skin, but he looks good. But for girls it is way different. 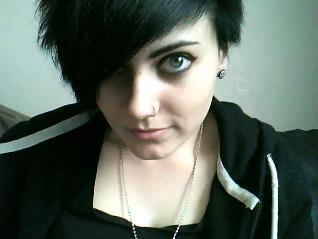 I have black hair too, with black eyes and pale face, but i'm not positive if i want to bleach my hair!! !Good luck! I really like your hairstyle... black is totally your color, but what I wanted to ask, is your hair short all around? or dose it have any more lengths to it?